PETALING JAYA, 23 Mar 2012 – Tan Sri Mazlan Nordin, journalist extraordinaire and UKM PhD Honorary degree awardee, passed away yesterday at University Malaya Medical Centre. He was 86. 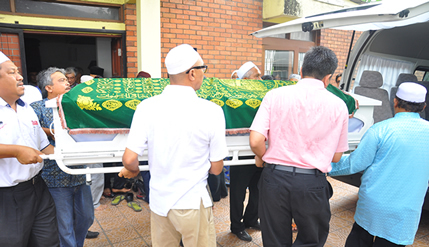 He was buried at the Bukit Kiara Muslim Cemetery before noon today. At his daughter’s house to pay their last respects were journalism luminaries, many of whom served under him, either in The New Straits Times, Utusan Melayu/Utusan Malaysia, Berita Harian and Bernama. Dato’ H M Shah, 91, although frail made a rare appearance because of his respects for Mazlan; Tan Sri Zainudin Maidin, former Chief Editor of Utusan Melayu Group and Minister of Information; Dato’ A Kadir Jasin, Group Editor of Berita Publishing; Dato’ Abdul Rahman Sulaiman, Bernama Chairman; Dato Meor Kamarulbaid bin Kamarul Shahid, Group Editor Berita Harian; Dato’ Abdul Jalil Ali, Editorial Advisor of Sinar Harian; P C. Shivadas, former Group Chief Editor of New Straits Times and Encik Abdul Jalil Hamid, Group Managing Editor of New Straits Times were also present. With his passing Malaysian journalism has lost a member who has dedicated his whole life to the profession. His final column will only see the light this Sunday in Mingguan Malaysia. While the journalism fraternity lost an eminent journalist, UKM lost a very good friend. Tan Sri Mazlan dedicated himself to journalism for the last 62 years. Even though his health was failing, he continued writing his column. His last piece will appear in Mingguan Malaysia this Sunday, 25th March 2012. He was UKM’s guest writer twice, for about four years, first in 2004 and later in 2010. He always ended his piece with “Karyawan Tamu UKM”. He was appointed to the post by the School of Media and Communication Studies, Faculty of Sosial Science and Humanities. His book Tokoh Wartawan Melayu was published by UKM Press. Zainuddin or Zam and Kadir remembered Mazlan as one who always wrote balanced and thoughtful articles. Shivadas said Mazlan was a good person not intimidating to those working under him and young journalists learnt a lot from him. Mazlan was born in Tanjung Malim Perak and was raised by his grandparents as his father, Nordin Abdullah died when he was just one year old. He was later selected to enroll at the Malay college Kuala Kangsar but his studies was interrupted by the war. It was during the war that he suffered hearing impairment when he was hit on both ears by a Japanese soldier resulting him not being able to continue with his studies after the war. He then worked for a while in a book shop in Kuala Kangsar and later joined Utusan Melayu in Singapore as a reporter in 1950. While there he also string for the Singapore Free Press where he honed his writing in English. Thus writing in both languages has become second nature to him. He also had a short two year stint with the Malay service of the Voice of America in New York until 1953 when he rejoined Utusan in Singapore. He joined Berita Harian after the paper was first published in 1956 joining the late Tan Sri Abdul Samad Ismail. He was later made the first Editor-in-Chief of Bernama in 1971 where he set up its economic service in both Malay and English. The move had assisted the Malay papers to start having economic news. He returned to Utusan as the Group’s Editor-in-chief in 1973 and served in that capacity for 10 years after which he was promoted as its Managing Director serving until 1986. While there he successfully increased the circulation of the weekly Minguan Malaysia reaching 400,000 something unheard of then. Mazlan had also served as Chairman of the Malaysian Press Institute for 15 years (1987-1996) and Chairman of the Asian Institute for Development Communication (AIDCOM) from 1993 and had also served as Chairman of the Press foundation of Asia from 2002. For all his services he was conferred the AMN, JMN, Dato’ Paduka Mahkota Perak and this year the Darjah Panglima Setia Mahkota (PSM) which carries the title Tan Sri. He was also a recipient of the Asean Award conferred by the Asean Culture and Information Committee in 1987, Exemplary Journalist by the Malaysian Malay Journalist Association in 1996 and the Tokoh Wartawan Malaysia in 2001. He was a prolific writer writing the ‘Awang Selamat ‘ column in Mingguan Malaysia, a column in Asiaweek, Personally Speaking in The New Straits Times, a fortnightly column in the Sun. He never stop writing.